The mass this Sunday, May 22, at Holy Name of Jesus Catholic Church in West Palm Beach, Fla., will be offered on behalf of five people. Only one of them is a recently deceased head of a global terrorist network. 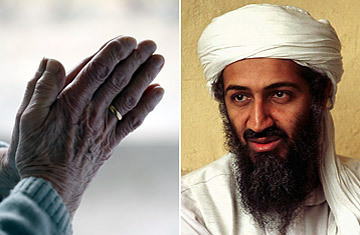 Parishioner Henry Borga requested the Mass intention on behalf of one Osama bin Laden. It is a long-standing tradition in the Catholic Church to offer Masses for souls in purgatory or to remember someone who has died or to honor someone still living. Borga told a local television channel that he placed the request for bin Laden because "he needs forgiveness and compassion from God." Not all of Borga's fellow congregants agree, although Holy Name of Jesus' priest has agreed to the Mass intention. Since bin Laden's death on May 1, many of us who follow a religious tradition have wrestled with the question of how to respond. We are taught to view all humankind as children of God. But surely that doesn't include people like bin Laden and Hitler and Timothy McVeigh, right? Instead of praying for their souls, shouldn't we celebrate their deaths? Jubilation was certainly the immediate reaction to the news that Navy SEALs had killed bin Laden. Crowds gathered spontaneously at the White House and Ground Zero, waving American flags and singing "Hey, hey, hey, goodbye," as if bin Laden had just fouled out of the game. But within minutes of my seeing those images, my Facebook feed started filling up with a very different sort of response. First one, then two, and then a steady stream of friends put up posts quoting Proverbs 24:17: "Do not rejoice when your enemies fall, and do not let your heart be glad when they stumble." The official response from the Vatican the next day counseled caution as well: "Faced with the death of a man, a Christian never rejoices but reflects on the serious responsibility of everyone before God and man." Evangelical Christian ethicist David Gushee wrote on the Huffington Post that those who follow the Just War tradition "believe war itself is tragic and that all killing in war, even in self-defense, must be treated with sobriety and even mournfulness." Even the Christian Broadcasting Network's David Brody, who had harshly criticized President Obama for not expressing joy in his announcement of bin Laden's death, reconsidered and apologized, citing the verse from Proverbs. Christianity wasn't the only religious tradition to put the brakes on a victory lap. Atlantic writer Jeffrey Goldberg posted a reflection by Erica Brown, a scholar at the Jewish Federation of Greater Washington, on what Judaism has to say about the deaths of evildoers. She referred to a Talmudic passage recording a fictional conversation between God and angels as the Egyptians drowned in their pursuit of the Israelites. "The angels, the text states, wanted to sing, but God turned to them and said, 'My creatures are drowning in the sea, and you want to sing?' " wrote Brown. "When it says in Genesis that we are created in God's image, it does not single out anyone as an exception to that rule." But it's one thing to hold back from rejoicing at death. In the harsh light of day, "Ding, Dong, bin Laden Is Dead" signs look a little juvenile, and those "U.S.A.!" chants were maybe a bit over the top. It's something altogether more difficult to ask religious believers to pray for bin Laden's soul or to forgive his murderous acts. Revenge is a natural human instinct for good reason  it deters aggressors from repeating the offense and punishes those who cause harm. "Justice has been done," said Obama in his statement on the killing of bin Laden. In contrast, forgiveness  particularly of someone who caused so much pain and loss  doesn't seem natural. Or fair. And maybe it's not. But religious teachings have a maddening habit of eliding the issue of fairness. Forgiveness is also sometimes as important for our sake  to alleviate the suffering that can accompany anger and fear  as for our enemies'. Two years ago I met Chantale Ukebereyinfura, a survivor of the Rwandan genocide. In 2006, the man who had killed her father went to her and begged forgiveness. Chantale, who could barely function through severe depression and PTSD, refused. "Forgiving or not forgiving him, it's all the same to me," she told filmmaker Laura Waters Hinson at the time for the documentary As We Forgive. "If I forgive him, I still have no peace. If I don't forgive him, it's the same." Three years later, I watched as Chantale sat next to her father's killer on a narrow bench in her hut. As the man talked about how grateful he was that Chantale eventually decided to forgive him, he reached over and held her hand. She didn't flinch but instead smiled, calm and at ease. I would not have believed it if I hadn't witnessed it, but there was no missing how the act of forgiveness had transformed Chantale. That doesn't mean that those who have lost loved ones to terrorism can or should forgive bin Laden. Forgiveness is much easier to grant when someone has asked for it and expressed repentance. And some faiths allow for exceptions, arguing that certain acts and certain people are so evil that they cannot be forgiven. The Christian tradition, however, is very clear on the example to which believers should aspire  Jesus forgiving his killers as he hung on the cross. In the days following bin Laden's death, Father James Martin wrote about the difficulty of forgiving such a man, noting, "Forgiveness is the hardest of all Christian acts." So maybe Henry Borga is onto something in kicking this one over to God and asking Christians to just pray about it. In all the churches I've attended over the years, I've heard prayers offered for Presidents and other political leaders, victims of war and natural disaster, and relatives and congregants. But I've never heard anyone pray for an enemy, despite the fact that it's an admonition from Jesus himself. Maybe that's the best place to start. See pictures of the life of Osama bin Laden.